LEPOWER Metal Floor Lamp is a part of LEPOWER's continuing pursuit for creating highly efficient and convenient products for our customers. Beautiful and Classic shape design, it's not only a floor lamp, but also a modern decoration for your bedroom and office. 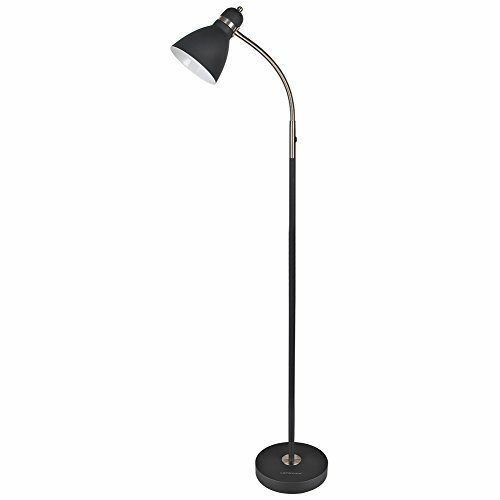 A nice, durable and functional floor lamp to meet your basic lighting needs, which perfectly for reading, also a modern decoration for your bedroom and office. With high-quality metal lampshade and base, enduring, durable and aesthetic, brightens your living room, bedroom, study room, office, kids room, or college dorm! 1 year warranty, 60 days money back guarantee for quality problem. Please feel free to buy. HIGH QUALITY MATERIAL: The lamp is integrated with high-quality metal lampshade and base, enduring, durable and aesthetic . It's weighted base and sturdy design makes it wobble free and safe to have around children and pets. ON/OFF SWITCH: conveniently located at the cord of the lamp for quick and easy use. LEPOWER WARRANTY: 12-month warranty for the light and and 60 days money back guarantee for quality problem. Please feel free to buy! View More In Floor Lamps. If you have any questions about this product by LEPOWER, contact us by completing and submitting the form below. If you are looking for a specif part number, please include it with your message.